Author and plant geneticist Enrico Coen presents the ideas in Cells to Civilizations slowly and carefully. He does not repeat himself so much as express the same idea several different ways, often using art as analogy to build conceptual foundations whose purpose might not be explained until chapters further on. Because the author builds his arguments slowly and seemingly roundabout, the reader will need a measure of patience with the text. 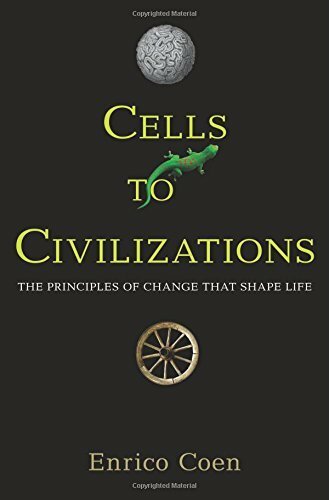 But Cells to Civilizations: The Principles of Change that Shape Life is well worth the effort. The evolution of species, the development of egg into a human, as well as learning and culture—all are very much different things. Even just one, the development of an egg into a human, occurs by different mechanisms at different stages. At the lowest level are patterns of cooperation of cells in a growing embryo. At the next level neural connections are formed through a baby interacting with the environment. At the highest level is culture where individuals may appear to be competing for survival and reproduction yet are also cooperating and building a civilization. Enrico Coen starts by addressing nonliving molecules and the process of diffusion. Diffusion is a statistical process that explains the population behavior of molecules, behavior consisting of random collisions and chemical reactions. The reaction-diffusion system is a competition of molecular patterns and explains how a cup of cold water in a warm room becomes room temperature over time. Evolution of a species through natural selection is also a statistical process. The principle of population variation comes from the statistical relationship between individuals and populations. Persistence comes from the strength of molecular forces over time, while reinforcement occurs by genetic copying. Reproductive success provides safety in numbers. Competition at the microlevel of biology contains collaborative outcomes without psychological intent. Cells have no mind yet are constructed of cooperative components. The creation of a protein is a cooperative effort because the protein is coded by a string of nearby bases on DNA, not just a single base. The fate of proteins and genes are also intertwined. Proteins necessary for cell life are kept nearby by the cell membrane, and cooperation is extended to all the cells in a multicellular organism. Competition and cooperation feed off of each other—cooperation is just as important in evolutionary change as is cooperation. The context for evolution is not fixed but constantly shifting. Problems of survival are often solved in diverse ways as evolution proceeds. An example provided is the variety of ways that the plant world pulls carbon from the atmosphere. Natural selection feeds back on itself; an advantage stops being an advantage when all use the same mechanism, and an advantage becomes a standard. Competition then finds something new. Competition does not reach a level but a relation—“better than”—and results in evolutionary paths that are diverse, convoluted, and idiosyncratic. Both birds and bats can fly. DNA carries heritable variations through mutations and genetic variation. Diversity and flexibility comes from the combinatorial richness of DNA. The genetic complexity of a genome of 100 base pairs built from 4 bases yields a complexity “space” on the order of 4^50 (1.27x10^30) possibilities. What constrains a genetic population to not vary too much is that a large genetic change results in an inability to breed. If sexual reproduction holds a species together, then why are there so many different species in the world? The author answers using language as analogy to ask, if there is one human species, then why are there so many different languages? What is true for language is also true for genes. Physical barriers can isolate subsets of populations, and separated populations can become significantly different over time. What if the two separated groups revisit? If the two groups are not significantly different and can breed then both groups may become reintegrated over generations. If the groups are unable to breed they can still coexist, possibly in different niches. Increasing specialization can drive groups genetically further apart. The author provides an explanation of genes and how they work. A gene is a stretch of DNA with two parts, a regulatory region and a coding region. Genes function as follows: DNA is copied (transcribed) to produce RNA then translated into an amino acid (a sequence of a protein). A protein folds into a shape and the protein’s shape is essential to its function, which essential to cell life (DNA->RNA->protein->cell life). There is inherent complexity to gene and protein regulation. You cannot predict what a regulatory protein will do without considering how that protein operates in relation to other regulatory proteins. Thresholding is inseparable from regulatory processes. Reinforcement (cooperation) alone or competition alone is not enough—there is a relationship between the two—and this relationship balances (or not) on thresholding. The ability to respond to environment leads to both differentiation and sharing of responsibilities. Specialization that occurs across single cell organisms can become differences that lead to cooperative cells in multicellular organisms. The common subject for study of genetics is the fruit fly. Much of the complexity of the anatomical development of the fruit fly embryo occurs through diffusion across membranes. The physical laws of biology and chemistry drive development of the fruit fly embryo. The embryo develops as layers, which form finer and finer gradations. Gradations become segments. Segments develop (head, antennae, wings) becoming more fruit fly than embryo. Evolution explains not just how organisms develop from fertilized eggs but also how they change as a species. There are three species of zebra each having a different number of stripes. Stripes for each species form at different times in the embryo, the earlier the formation the less the room for stripes. The difference in the species is the difference in how growth in the embryo is regulated. Differential growth can also be seen in the shapes of plants, trees. And what is true for the fruit fly embryo is true for the zebra embryo is true for the human embryo. The chapter on humble responses explores instinct and learning. Choice begins with simple homeostatic mechanisms, instinctive responses. Single celled green alga with flagella, swim to the light to survive by photosynthesis. Instinctive response can also adjust over time. Escherichia Coli not only swim toward food but also swim away from noxious compounds like acids. Yet E. coli may be habituated. If conditions are generally good E. coli will become less sensitive to variations of goodness. Instinct can be modified by recent history of experience. Plants too. Some plants have an internal clock and adjust their form according to time of year, monitoring day length by the amount of light and marking time. Learning is the setting of thresholds in what otherwise would be instinctive actions. Instinctive reflex can weaken or strengthen with familiarity (habituation), and there can be levels to habituation, long term and short term. Long-term habituation leads to a change in anatomy. The Venus flytrap can distinguish between a gust of wind and an insect. Some part of its anatomical arrangement reflects a range of correlations in the environment. There is no sharp line between instinct and learned development. Not so much for plants and microbes—learned development is peculiar to elaborate nervous systems of flies, slugs, dogs, and humans. Complex organisms can learn things that never occurred before in evolutionary past. A dog learns its human master’s voice. A rat learns a maze. The benefit of more complex development has its costs, the more complex behavior the greater time it takes to mature to a larger size and more complex brain. Prediction, the learning of cause and effect is important to survival and the ability to predict appears to be improved through the ability to learn. There is a neural basis for prediction as evidenced by Pavlov’s dog experiments and studies of conditioned reflex responses in rats and monkeys. In the brain are predictive, expectational and discrepancy neurons in the brain that form feedback loops. The feedback loop is self-limiting as timing is as important as the strength of the neuron firing. The brain also appears to be wired for learning through the presence of mirror neurons. A monkey watching another monkey grasping fruit triggers its own mirror neurons that reflect grasping. There are different levels in learning as there are different levels in genetic development. The learning of Pavlov’s dog is not the same as the learning of a monkey reaching for an apple—as varying experience is not the same as genetic variation, is not the same as collisions among molecules. The point the author makes is that though the details vary the core principles are the same. How are these principles connected with the more complex human processes like language, creativity, and consciousness? The author admits he does not know, and wisely avoids the controversies of nature versus nurture or the claims of existence of altruistic genes. Enrico Coen does however speculate on the importance of calibration for higher levels of learning—the calibration between goals, actions and effects. Perception calibrates an imperfect act of movement as a feedback loop at a layer above the neuronal feedback loop. Expectation acts as a model whereby a pattern of discrepancies between expectations, movements and consequences lead to new expectations. The patterns get more complicated when more is going on but again the principles remain the same. As for the more controversial issues of mind and choice, the author does not stray far from the biological level of learning but claims that we are born with a set of values that elicit actions of engagement or avoidance that can be modified through experience. The author concludes Cells to Civilizations with his take on civilization. The history of culture is the history of humans as a civilization. Civilization he says is inseparable from culture, and culture is inseparable from science. Culture shifts are relational. The values humans have can change over time, and some of this change is driven by science. Where science leads to improvements (communication, transport, hygiene, etc. ), improvements lead to cultural shift. Another feedback loop it seems. Cells to Civilizations may be difficult to categorize, sitting somewhere between popular science and philosophy. There are plenty of illustrations and color plates, indicating the publisher has faith in the book. The expository style is somewhat intense but certainly not over-dense. The ideas are subtle, possibly significant, and slightly unsettling. What more could a reader wish for?